Blackpool Sixth is fully committed to safeguarding the welfare of all children and young people. It recognises its responsibility to take all reasonable steps to promote safe practice and to protect children from harm, abuse and exploitation. The college acknowledges its duty to act appropriately to any allegations, reports or suspicions of abuse. Staff and volunteers will work together to encourage the development of an ethos which embraces difference and diversity and respects the rights of children, young people and adults. Blackpool Sixth acknowledges its duty to act appropriately to any allegations, reports or suspicions of abuse. This policy applies to staff, students, Governors and visitors to the college. The policy covers the roles and responsibilities described in the Working Together to Safeguard Children guidance (HM Government, 2013) and Keeping Children Safe in Education (HM Government, 2014). 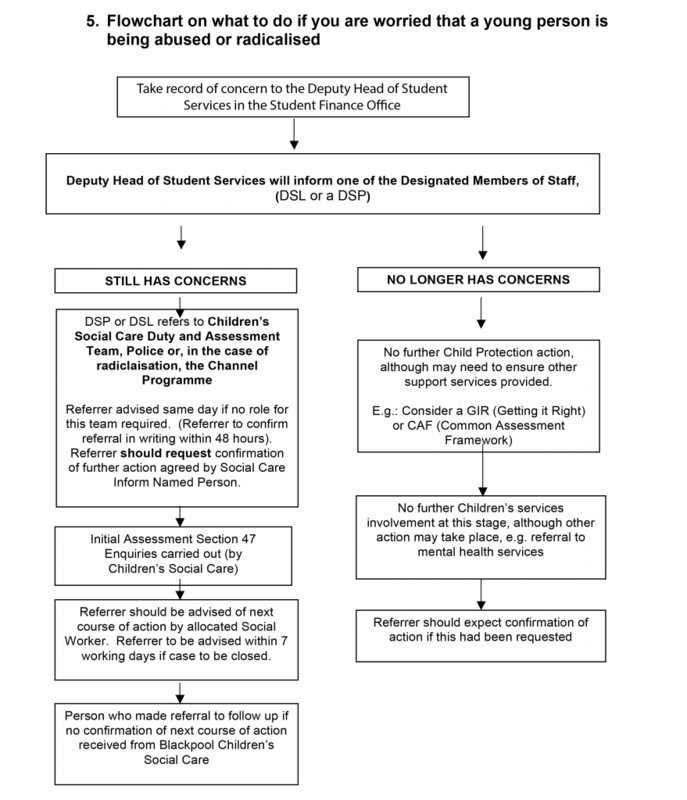 This document has been written to inform staff, students and visitors about the college’s commitment to Safeguarding and the gravity with which it attends to allegations of abuse. Designated members of staff for Safeguarding: Designated Safeguarding Lead (DSL): This is the person with overall responsibility for safeguarding in the college, making decision regarding systems and training. Designated Safeguarding Person (DSP): This is a person with day-to-day responsibility for safeguarding in the college, including systems and training. The welfare of a child or young person will always be paramount. The welfare of families will be promoted. The rights, wishes and feelings of children, young people and their families will be respected and listened to. Safeguarding is everyone’s responsibility – for services to be effective each professional will play their full part. Those people in positions of responsibility within the organisation will work in accordance with the interests of children and young people and follow the policy outlined in this document. Prevention – the creation of a college atmosphere in which fear is absent, students trust staff, and students communicate well with staff. Protection – Agreed procedures which ensure that staff are informed and aware of the college’s policy, guidelines and procedures and are supported to respond appropriately and sensitively to safeguarding concerns. Support – Appropriate support for students who have concerns about abuse and for college staff who support them. The policy applies to all college staff and volunteers, to all students under the age of eighteen and to all vulnerable adult students. We recognise that for young people high self esteem, confidence, supportive friends and clear lines of communication with trusted adults can help to prevent abuse. Clear priorities for safeguarding and promoting the welfare of children, explicitly stated in strategic policy documents. A clear commitment by the Senior Leadership Team to the importance of safeguarding and promoting children’s welfare. A clear line of accountability within the organisation for work on safeguarding and promoting the welfare of children. Recruitment and human resources management procedures that take account of the need to safeguard and promote the welfare of children and young people, including arrangements for appropriate checks on staff and volunteers. Procedures for dealing with allegations of abuse against members of staff and volunteers. Arrangements to ensure that all staff undertake appropriate training to equip them to carry out their responsibilities effectively, and keep this up-to-date by refresher training at regular intervals; and that all staff, including temporary staff and volunteers who work with children, are made aware of the college’s arrangements for safeguarding and promoting the welfare of children and their responsibilities for that. Policies for safeguarding and promoting the welfare of children and procedures that are in accordance with guidance and locally agreed inter-agency procedures. Arrangements to work effectively with other organisations to safeguard and promote the welfare of children, including arrangements for sharing information. A culture of listening to, and engaging in dialogue, with young people – seeking student’s views in ways that are appropriate and taking account of those views in individual decisions and in the development of services. Appropriate whistle-blowing procedures, and a culture that enables issues about safeguarding and promoting the welfare of young people to be addressed. All policies can be found on our website, please click here. All adults working with or on behalf of children and young people have a responsibility to protect children and young people. The Designated Safeguarding Lead (DSL) and all Designated Safeguarding People (DSPs), however, are key people within the college who have specific responsibilities under safeguarding procedures. The names of those carrying these responsibilities are listed on the cover sheet of this policy. To ensure the college’s safeguarding policy is up to date. To ensure that all staff receive up-to-date, high quality, appropriate training, guidance and support to undertake the effective safeguarding of students. Staff who are very inexperienced/new to sector or identified at interview as needing extra safeguarding training will receive small group and more intensive safeguarding training. To complete Getting it Right (GiR) referrals or CAF (Common Assessment Framework), where necessary, and liaise with the local Children’s Services upon completion. To collate regular, accurate and timely data on safeguarding and child protection incidents/outcomes. To produce accurate and timely reports for SLT and Governors at least once per term. The Children Act defines a child as a person under the age of 18 years. Safeguarding responsibilities also extend beyond the age of 18 to a group of vulnerable adults. A vulnerable adult is defined as a person aged eighteen or over, who has either a dependency upon others or a requirement for assistance in the performance of basic functions. This can be as a result of a learning or physical disability, a physical or mental illness or an addiction to alcohol. Abuse is when a child or young person is hurt or harmed in a way that causes significant harm to that child and which may have an effect upon the child’s health, development or wellbeing.Significant harm is Ill-treatment that has severe effects on the young person’s health and development. This could be a single traumatic event e.g. a violent assault, suffocation or poisoning. More often significant harm is a combination of significant events, both acute and long-standing, which damage the young person’s health and development.Where it is believed that a child is suffering from, or is at risk of significant harm or radicalisation, we will follow the procedures set out in this policy. Discriminatory abuseIn respect of safeguarding individuals from radicalisation, the college works to the Prevent element of the Government’s Counter Terrorism Strategy, and where deemed appropriate seeks external support for learners through referrals to the Channel Programme. It is recognised that radicalisation can occur to an individual from any section of society and is not particular to any racial, ethnic or social group. It is further recognised that in many instances the process of radicalisation is essentially one of grooming by others. Immediate action may be necessary at any stage in involvement with children, young people and families. IN ALL CASES IT IS VITAL TO TAKE WHATEVER ACTION IS NEEDED TO SAFEGUARD THE CHILD/YOUNG PERSON. If emergency medical attention is required this is secured by calling an ambulance (dial 999). If a child is in immediate danger, the Police should be contacted (dial 999) as they alone have the power to remove a child immediately if protection is necessary, via Police Protection Order. Safeguarding raises difficult issues of confidentiality. Staff have a professional responsibility to share information regarding abuse with the college’s DSL or a DSP. If a member of staff thinks that a student might be about to disclose abuse they must gently point out to the student that they are willing to listen but that they will have to inform someone else. College staff cannot offer absolute confidentiality to students. There are clear situations when it is essential that staff share information with their colleagues. In the case of abuse it is essential that staff share information with the DSL or a DSP. there is information or evidence that a student under the age of 18 is being abused or radicalised. it is simply outside the scope of your experience to deal with the situation. In situations which do not fit neatly into the above categories and when staff find themselves uneasy and confused about what action, if any, to take, they should discuss the situation with the Head of Student Services or their line manager who will help them to decide on a course of action. If Child Protection is the main issue of concern the DSL or a DSP will advise. Sometimes a student may ‘blurt’ out details of abuse, before you have a chance to explain your responsibility. Tell the student immediately that this information must be disclosed, but only to the DSL or a DSP at this stage. where contacting parents/carers would place a young, yourself or others atimmediate risk.These decisions should not be taken in isolation, consult with a DSL or a DSP immediately. Students need to know that they will be listened to and their concerns will be taken seriously. Young people will talk about their concerns and problems to people they feel they can trust. The person a child talks to will not necessarily be a senior member of staff. If you are approached by a student wanting to talk, you should listen positively and follow the advice given below. Listen carefully to the young person giving them time and your full attention. Allow the child to give a spontaneous account. Do not stop a child who is freely recalling significant events. Rather than directly questioning the student, just listen and be supportive. Do not ask any leading questions as this may prejudice the outcome should any allegations go before a court. Explain that you cannot promise not to speak to others about the information they have shared – do not offer false confidentiality. Say something like “I don’t mind you telling me this but you must realise that I have to pass this on to a member of staff responsible for safeguarding. I cannot promise absolute confidentiality”. Reassure the young person that they have done the right thing in telling you, they have not done anything wrong and you will do everything possible to help them. Tell the young person what you are going to do next and explain that you will need to get help to keep him/her safe. Tell the student that confidences will be shared only with those who have to know and that all guidance, advice and support possible will be given. This might include referring the student to a specialist agency (agencies) outside the college, where appropriate. Make an accurate record of the information you have been given, taking care to record the timing, setting and people present, the child’s presentation as well as what was said. Sign and date the record and take it to a DSL or a DSP. If a DSL or a DSP is not available then contact a member of the Senior Leadership team. If there is no one available and you believe the young person is in immediate danger then contact the Police (dial 999). Ask the young person why they are upset or how a cut or bruise was caused, or respond to a child wanting to talk to you. This practice can help clarify vague concerns and result in appropriate action. If you are concerned about a child you must share your concerns. Initially you should talk to one of the DSL or a DSP if you notice signs or symptoms of possible abuse. Immediately, make a written note of your observations. when the concerns relate to any member of the organising committee. Advice can also be sought from NSPCC. Consultation is not the same as making a referral but should enable a decision to be made as to whether a referral to Children’s Social Care or the Police should progress. All staff and volunteers who are concerned about a young person’s welfare or who believe that a young person is, or may be, at risk of abuse or radicalisation should pass any information to a DSL or a DSP as soon as possible. To make a referral, staff should take a written record to the Student Finance Office and discuss their concerns with the Deputy Head of Student Services or the Welfare Officer, if the Deputy Head of Student Services is not available. The Deputy Head of Student Services will contact the on duty DSP. The DSP will assess the risk and decide on the action to be taken. If the young person is in need of support from outside agencies or at risk of significant harm, a referral will be made to Children’s Social Care or the Police giving information about concerns. Parents/carers should be informed if a referral is being made, except in the circumstances outlined on page 9. However, inability to inform parents for any reason should not prevent a referral being made. It would then become a joint decision with Children’s Social Care about how and when the parents should be approached and by whom. If the concern is about significant harm or risk of significant harm from a family member or someone known to the children, a telephone referral to the Children’s Social Care Duty & Investigation Team must be made. If the concern is about significant harm or risk of significant harm from someone not known to the child or child’s family, a telephone referral should be made directly to the Police with consultation with the parents. If the concern is about radicalisation, the DSP will use the Channel Referral Process outlined in the pan Pan Lancashire Policy and Procedures for Safeguarding when assessing the risk and making a referral. Following a referral to outside agencies, the DSP must ensure that an accurate record of the concern(s) and action agreed is made at the time. A CP1 form should be used for recording child protection concerns. Safeguarding records will be kept in a confidential and secure file in the Student Finance Office. Chronologies of events will be added to an individual’s safeguarding file whenever new information is known or action is taken. Any allegation of abuse of a young person by a member of staff or volunteer made to another member of staff must be reported to the Deputy Principal immediately. The Deputy Principal will inform the Principal and the Head of Human Resources. The individual who first received/witnessed the concern should make a full written record of what was seen, heard and/or told as soon as possible after observing the incident/receiving the report. It is important that the report is an accurate description and is signed and dated. behaved in a way that has harmed or may have harmed a child. If a complaint is made about the Principal this should be reported directly to the Chair of the Governing Body or in her/his absence the Designated Governor for Safeguarding.Any allegations are always taken seriously. Details will be recorded and depending upon the nature of the allegation a referral may be made to the Police or social services. In some circumstances the allegations will be dealt with by other agencies where college is bound by safeguarding and/or other legal requirements. Where it is considered that the allegation is unfounded or is a matter for disciplinary action, the college’s own procedures will be followed. In addition to referral to external agencies, the college will follow its internal disciplinary procedures. Should it be considered necessary to suspend a member of staff this will be instigated by the Deputy Principal or the Director of Finance. All allegations about members of staff will be logged with the appropriate Local Authority Designated Officer (LADO). All records will be kept by the Head of Human Resources. The college understands the power of education in improving the life chances of all young people including those who may have been involved in early criminal activity. Where a student is subject to a criminal investigation, college may suspend the student until the criminal investigation and legal proceedings have concluded. However, this does not automatically preclude college from progressing its own disciplinary action. Parents/carers will be kept informed verbally and in writing of any action taken and will be included in all meetings/risk assessments, where appropriate. The student and parents/carers should be reminded that whilst criminal investigations are underway they are obliged to keep the Head of Student Services informed of any progress and/or change in status regarding his/her case. As a first step the student may be required to comply with specific conditions, for example agreeing not to contact another student or students. The student may be suspended or excluded, until such a time as any criminal proceedings have concluded. A precautionary suspension or exclusion should not be regarded as a penalty, and does not indicate that the student is presumed guilty of any offence. Suspensions will normally be carried out by the Deputy Principal or Head of Student Services. The decision to temporarily suspend and/or exclude the student and the reasons why this action is being taken may be communicated verbally in the first instance and followed up in writing within 1 working day. During the suspension continuation of learning will be supported by the provision and marking of work. The Head of Student Services will be the designated contact. The student may appeal against the decision to suspend and/or exclude in writing stating the reason for the appeal to the Deputy Principal within five working days of the date issued on the notice of the exclusion. Whilst the precautionary suspension and/or exclusion is in place, the student may request a review if there is a relevant change to his/her circumstances. This request should be made in writing to the Deputy Principal, who will respond within ten days of the receipt of the letter. The Head of Student Services will review the case on a weekly basis and will make recommendations to the Deputy Principal if any further action is required during this review period. Where criminal proceedings (including bail conditions, period of time spent on remand, period of time served in custody following conviction) result in a student being absent from his/her study for a period of less than 4 weeks it will normally be the case that the student’s place at college will be suspended for this period. Where criminal proceedings (including bail conditions, period of time spent on remand, period of time served in custody following conviction) result in a student being absent from his/her study for a period in excess of 4 weeks, the student will be deemed withdrawn from the college. The student may then reapply for admission and, as part of the standard admissions process, will be required to declare criminal convictions to be considered prior to a decision regarding an offer of a place. Where the student has been acquitted the college will take into account the decision of the court. The conviction in a criminal court shall be taken as conclusive evidence that the alleged offence has occurred. Where a criminal conviction has been made, the focus of the disciplinary proceedings may include an assessment of the risk posed to staff or students and an assessment of the impact caused by reputational damage to the college. Where, following initial investigation, a decision has been taken not to proceed to a criminal trial, this does not preclude the college from conducting further investigations and/or instigating disciplinary proceedings in respect of outstanding matters of concern that have not been addressed through criminal proceedings. All applicants are asked on the application form if they have a criminal record or ongoing criminal proceedings. Those answering ‘yes’ are asked to complete a supplementary form giving details. The college may seek advice and information from other agencies involved with the applicant, or arrange for the student and parents/carers to be interviewed to collect further information or to clarify or confirm information. The Head of Admissions will inform the applicant of the outcome. The Head of Student Services will inform any staff who need to know if a student isadmitted to the course with conditions for managing risk or particular support needs. Otherwise information on the criminal record is not passed on. Failing to disclose a minor issue which does not pose any risk to the college community or impact on the student’s ability to complete the course successfully will be deemed serious misconduct and will result in a stage 3 Final Warning. Failing to disclose a significant issue which might pose a risk to the college community or impact on the student’s ability to complete the course will be deemed gross misconduct and the student’s place at college may be withdrawn following investigation and a formal disciplinary hearing. College may suspend the student until a thorough investigation and risk assessment has been conducted. The college will deal with all matters relating to declarations of convictions or criminal proceedings in a confidential manner and details will be held securely and separately from other information the college holds. Information will only be shared with colleagues or other organisations on a ‘need to know’ basis and only to ensure the safety of all members of the college.